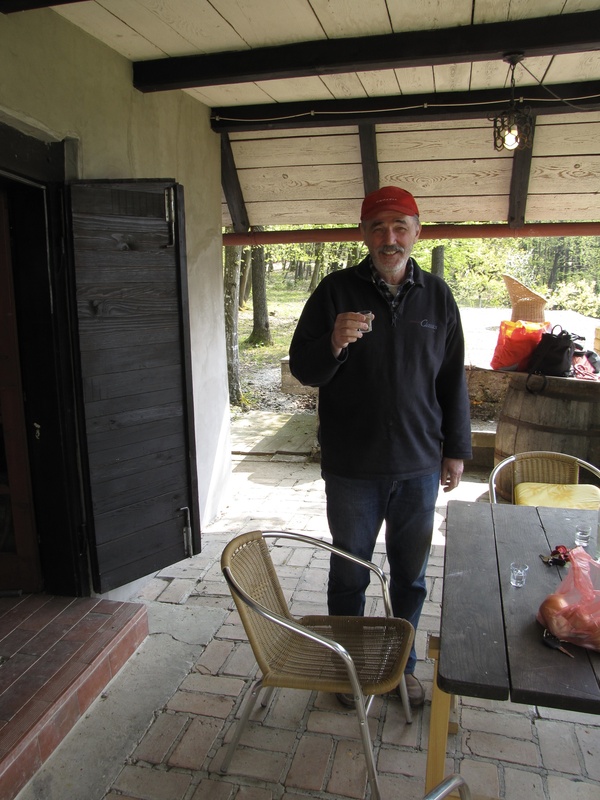 The initial and primary purpose of this trip was to visit the Balkans. There were two reasons: Dame Rebecca West and Dubravko (Don) Frleta. Rebecca’s real name was Cicely Fairfield and she was a precociously and prodigiously talented writer who became successful very early in life. She was 24 when George Bernard Shaw said: ‘Rebecca West can handle a pen as brilliantly as ever I could and much more savagely’. At the age of 21 she met H G Wells (via a savaging she had given one of his books) and became third wheel in a ménage a trois that was maintained for ten years. Wells at that time, however strange this might seem, was a leading public intellectual (and a very keen proponent of ‘free love’). She had a child, Anthony Panther West (‘Panther’ being Rebecca’s pet name for Wells; some things are probably best kept private), who growing up was instructed to call Rebecca ‘Auntie’ or ‘Auntie Polly’ and Wells ‘Wellsy’, adding to the uncertain nature of nomenclature in this particular environment. Anthony was alerted to his real provenance somewhere between ages six and eight. He became a writer himself and published a fictionalised autobiography which cast the mother figure in an unfavourable light. The actual mother managed to suppress publication in England until her death. This suppression brought their relationship to an end more or less as final as her death. She married a banker, Henry Andrews, in 1930. It seems possible that their marriage was never consummated. She died in 1984 very wealthy and laden with honours. Public life eh. What a party. In 1936, 1937 and 1938, auspicious years in Europe, she made trips to Yugoslavia. 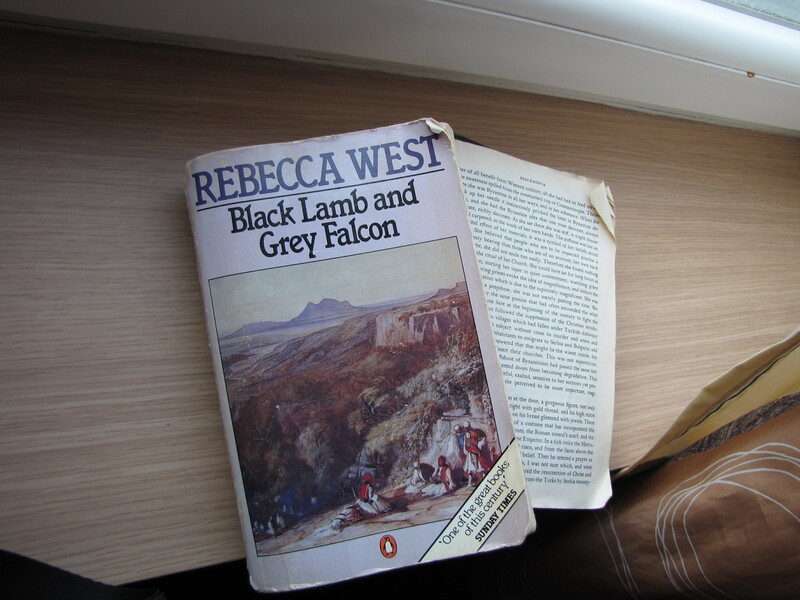 These trips formed the basis of her masterpiece Black Lamb and Grey Falcon, all 1200 pages of it. It has been referred to slightingly as a travelogue, but to quote another reviewer, himself borrowing: she has two subjects, Yugoslavia, and everything else. And she certainly does: the history of the late Ottoman Empire, the nature of religious experience, the formative place of handcrafts in the life of a village, the education of girls and the wearing of school uniform, the particular colour of Trogir (toast or butterscotch?) and the musical quality of the Plitvice lakes (‘Mozartian’). She makes one of her travelling companions German, and Gerda makes a wonderful foil, blank of insight and full of unrepentant prejudice. The real topic of the book is the intersection of western and eastern cultures and the mutual incomprehension that engenders. The west does not come off especially well. She lets her characters talk about the mutual antipathy between Croats (the west) and Serbs (the east) — and that is its pointy end. The book is ambulatory, awkward, contains wild and anachronistic assertions, is consistently overwritten … and is simply magnificent. I started reading about the Balkans during the 1990s wars and it kept coming up as a reference point. I read it then, and have since wanted to see for myself. 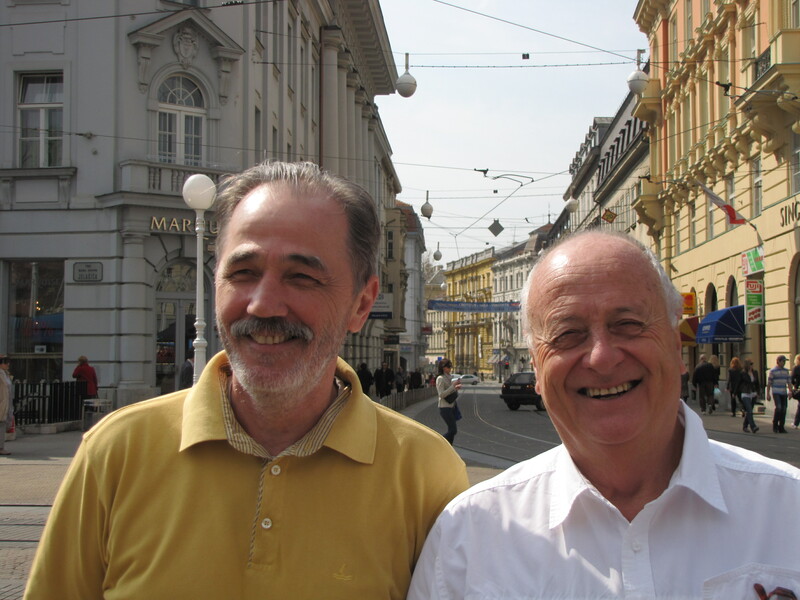 Dubravko Frleta (at left with his buddy Mike Rowland) has led a less public but at least as interesting a life. He signs his emails ‘Don’, and that may be his wish. But he’s one of those people who with an equal mixture of exasperation and affection get called by their surname. He’ll be whatever seems to sound right here, but that’s him. On his own admission he had a childhood and youth littered with achievement. He learnt Russian as well as Latin at school (the top stream school in Zagreb still teaches Latin and Ancient Greek to all), and his Russian and his cleverness with maths provided him, a long time ago, with a trip to Moscow and Leningrad (St Petersburg). But in the ‘70s (called by some historians ‘the Croatian Spring’. Don snorts.) he came on exchange to Australia, to Latrobe University in fact, to teach in the faculty of Agriculture as an economist. In the course of this process he met Mike Rowland one of my closer friends and colleagues over the past 15 or 20 years. ‘It was January and I was in Glenn College dining room having lunch. There was no one there of course, being January. We might have nodded at each other. Anyway he came over and said hello. The next day we had a cup of coffee and that was that.’ They have kept in remarkably close touch ever since. We met Darko and Katica Biljakovic on this basis. Darko is another mathematician and a very longstanding friend of Don’s. His childhood school sweetheart Katica is his wife of many years and Head of the Institute of Physics in Zagreb. We stayed with them at their ‘second’ house on Korcula and saw them later in Zagreb. Arranging for us to meet them was one of the many kind and insightful things Don did for us. Dubravko began his career as an academic mathematician. Having been a student of his has become a requirement for being a senior figure in the current Croatian government. After the break up of Yugoslavia he seems to have talked his way very quickly into the new opportunities for private enterprise, in his case the fledgling Croatian airlines. Since then he has worked for a number of companies and is now Direktor, Službe za vođenje projekata i brigu o korisnicima, Sektor za koordinaciju ICT for Agrokor. [In 2010. In 2014 a doting retired grandfather.] Agrokor is a conglomerate which has (from memory) 29 businesses including bottling and selling water, broad acre farming and providing ‘extreme’ experiences for tourists on trips down the Danube. Don’s job is to coordinate the systems, information and otherwise, of these disparate groups. I got an insight into Don at work when he was trying to send us a gigabyte of photos. This didn’t work; that didn’t suit; the other was too hard for muggins (me). So he patiently probed until he found what would work. He was purposeful, single-minded, self-contained, but also wanting to do just what he wanted to do — not provide the 60 best photos, but the lot in the highest possible resolution. I can hear him saying: If you can do that, why not? (Shrug, gesture, opening palms.) I think Don probably works very hard and that the two weeks he took off to look after us was the sacrifice of a very busy man. And that is to say as well, once he got into the swing of it, he enjoyed it as much as we did. He certainly loved seeing his friend Mike, and he was a dear companion to us all. There are his friends, and there is his family. Dina who was a most welcome adjunct on our trip, the official photographer, is 20 years old, a finishing secondary student (kids start and finish school two years later in Croatia), and Ivan who has a job with General Motors (and is as good? better? than his father at tennis). His wife Mirjana works as an accountant. All delightful and hospitable people. And there is his cottage. Twenty minutes from his home in Zagreb on half an acre or so of land is a very stylish ’shed’. We don’t have a suitable term. He says ‘cottage’ and that is probably pretty close. The photos will illustrate. This is another of the loves of Don’s life. It is close enough to visit after work on longer spring and summer evenings, accessible enough to fool around with on weekends, undeveloped enough for there to be plenty to do for a man with tools. Don had, in consultation with the customers, designed a two-week tour for us. Mike wanted to go back to Mostar where he’d been before and on to Kotor in Montenegro, and we both wanted to go to Sarajevo. This was accommodated. How often have you shown other people your favourite things? It doesn’t happen all the time. I’m sure one of the reasons is that you don’t want your perception of those things challenged. This will always be under threat if you invite an audience. I don’t know how many converts I’ve won for the big trees at Cambarville for example, but Lord knows I’ve tried often enough; shamelessly. Maybe Andy Webster, but Andy has a capacious and generous appetite and is reliable in that regard. That would be one of about 486. Here’s a teacher’s task. How can I persuade you that, for example, European history (or physics or Latin or anything else that sounds hard, boring or remote) is a matter of personal importance and interest? On the day we left Europe ‘The Times’ had on its front page a story about the decline of participation in second language learning in England, more or less the same report that I helped the Asia Ed Foundation prepare before I left about contemporary Australian students. Australian students are just not very interested in learning another language. They don’t have to speak one in their daily lives, probably won’t even encounter one despite the 168 languages which aren’t English that are spoken by more than one person as a matter of course in Australia. Another reason which always turns up is the perceived quality of the teachers. Language teachers love their language but can’t teach and language classes are the ones you muck around in. I can imagine these poor creatures putting their favourites, their loved ones, their heritage, on the table and having these most precious of parcels rejected by callow brutes. And this is part of the core of a teacher’s work. It constantly entails risk. Will the students like it? Will they love it as I do? Can I communicate, and control, my ardour. Don had his babies on the table. This is Don. At risk. With customers who claim to be happy with anything. But that in itself he might see as a weakness. They should only want the best — just incidentally what I want to give them — and know what that is both intuitively and as a matter of being properly brought up. I’ve got to say, that’s what we got. But then again, I’d be happy with anything. One thing Don has up his sleeve, when he needs it, when he feels he needs it, when he can be bothered needing it, is a gesture owned by very good teachers, at once charming, disarming and inviting: an intent gaze, sparkling eyes but it’s no joke, face tilted slightly forward, a motion of the head which could be a nod, a slightly open mouth — saying: Come on. Respond. Think. Engage. See what I see. What a wonderful gift. We watched him practice it with Bosnian police. We also watched him convincing Myrna that in a marriage equality is paramount, but that the man should always have two votes. Despite finding unilateral support for his views from a boatman at Visovac (with the useful additional information that Australian women are lousy lovers), the Bosnian police were pushovers by comparison. 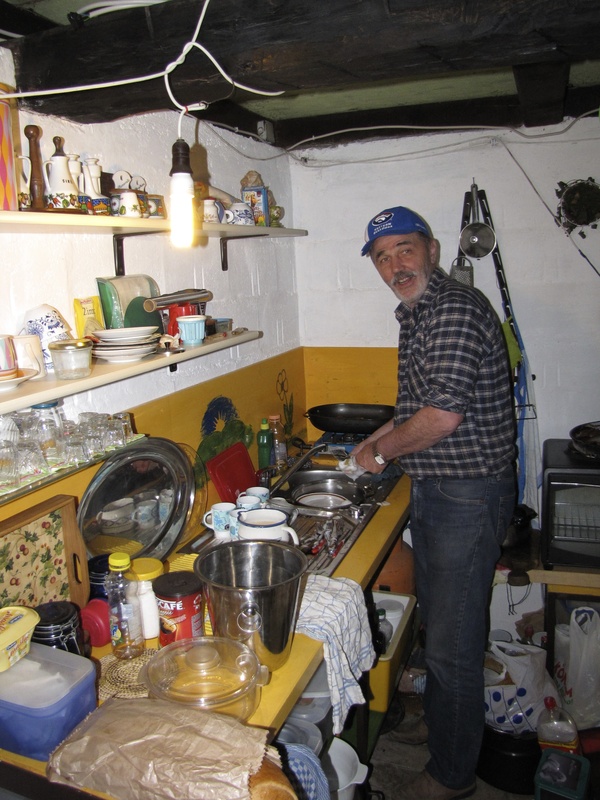 The photo of Don doing the dishes is believed to be an important historical document. •••••••••••••• For the story, read on here.